Le Club AccorHotels has launched a great offer for stays in Rio de Janeiro that are booked and consumed between October 31 – December 31, 2016. Member can earn up to 3,000 Le Club AccorHotels bonus points per stay depending of the brand stayed at. This would be a great way to reach Le Club AccorHotels Gold or Platinum status easily. Remember that all the points earned count towards the status until the end of this year. I will be in Rio next moth and will certainly take advantage of this offer. 1. The terms and conditions Le Club Accorhotels apply to the supply Enjoy Rio de Janeiro and earn points! And to enjoy it must be associated with Le Club Accorhotels. 2. This offer allows members Le Club Accorhotels, regardless of their status, benefit from the accumulation of 1,000 points for stays in hotels ibis, 2,000 points for stays in hotels Mercure, Novotel, Adagio and Mama Shelter and 3,000 points for stays in hotels Grand Mercure, MGallery and Sofitel participants Loyalty program Le Club Accorhotels. 3.This offer is valid for hosting an associate of 10/31/2016 to 31/12/2016 in one of the participating hotels of Rio de Janeiro , which has been booked between 31.10.2016 and 11.30.2016 . 5. Any consecutive accommodation (check-out and check-in on the same day) at the same hotel will be considered as one stay.This unique lodging once will be valid for offering Enjoy Rio de Janeiro and earn points! . 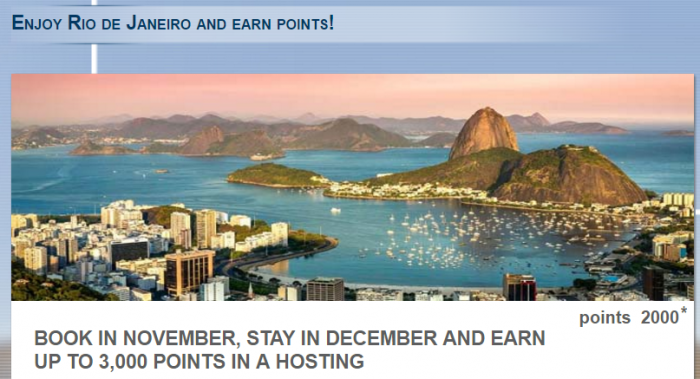 you must subscribe to the offer Enjoy Rio de Janeiro and earn points! Before making a reservation to participate in the offer .